Lalique ‘Tête de Paon’ peacock mascot – estimated at £15,000-25,000 at Bonhams. 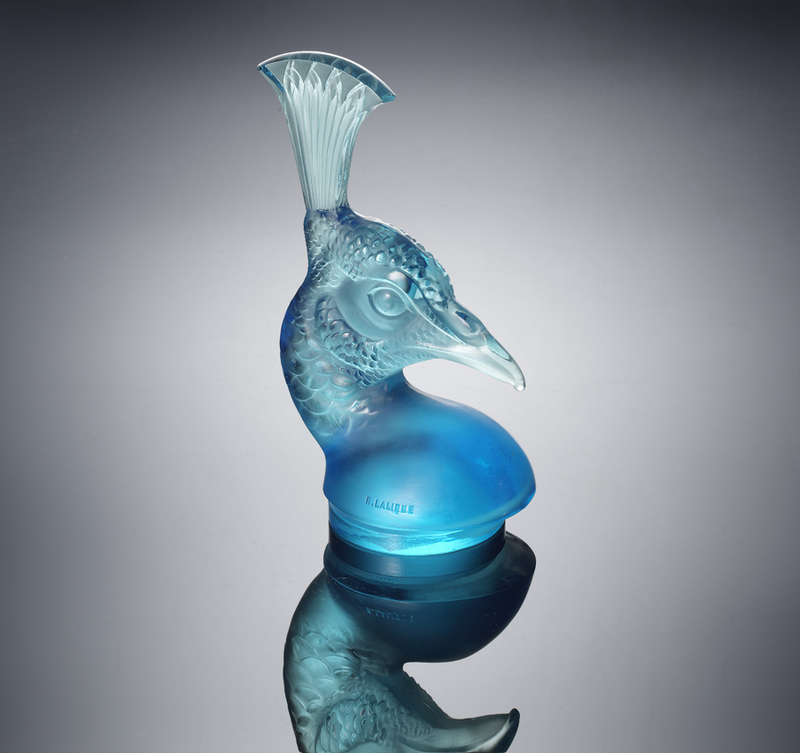 Assembled over the past 20 years by John Nemeth, the 211-lot auction offers a range of the French glassmaker’s production including a large selection of car mascots, scent bottles, seals, small boxes and vases in clear, coloured, frosted and opalescent glass. A portion of the collection was lent to the Musée Lalique in Wingen-sur-Moder and featured in its special exhibitions such as Lalique and the Art of Travel. Here are five highlights from the sale. Lalique ‘Alicante’ vase – estimated at £20,000-30,000 at Bonhams. One of the highlights of the collection to be sold by Bonhams on February 20 is this strikingly coloured Alicante vase, a design of 1927. The triple-cased, green, mould-blown piece is estimated at £20,000-30,000. Among the many car mascots in the collection is this blue Tête de Paon peacock mascot, a design of 1928, 7in (18cm) in height. It has an estimate of £15,000-25,000 in Bonhams’ sale on February 20. 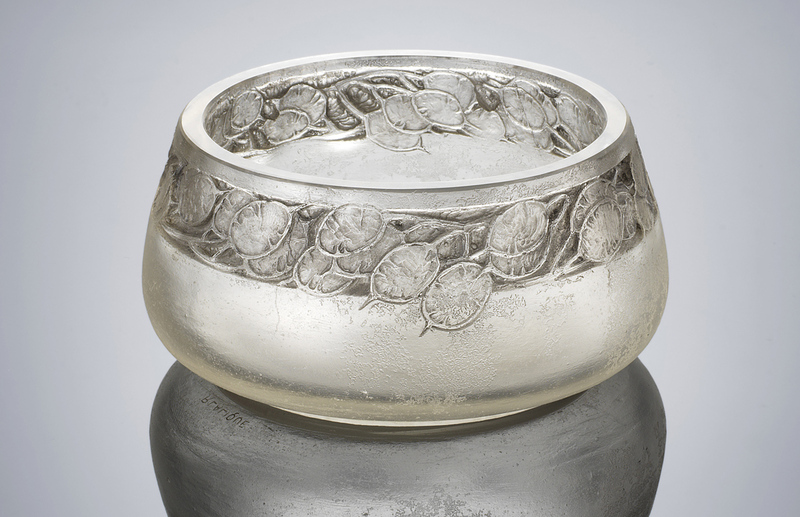 Lalique ‘Frise Monnaie du Pape’ vase – estimated at £25,000-35,000 at Bonhams. 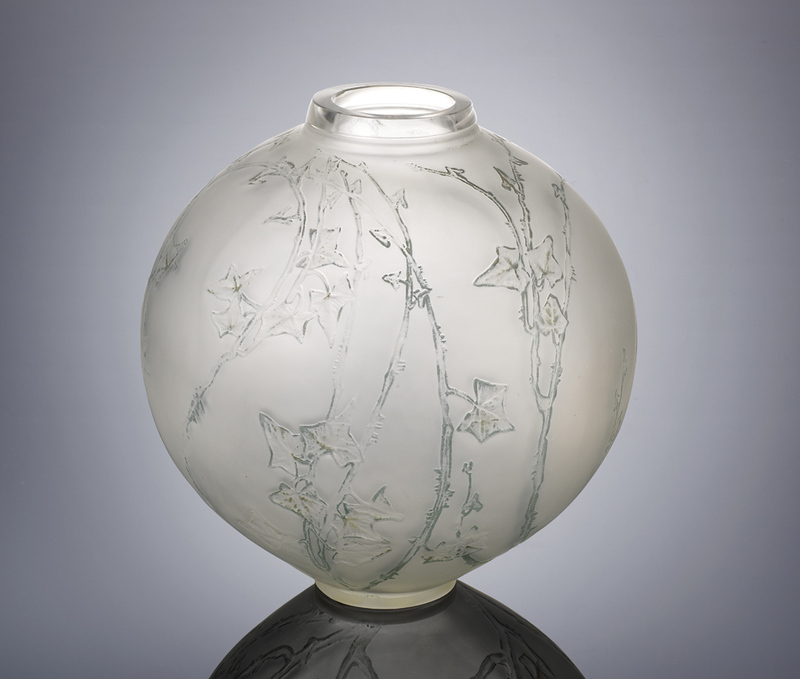 An example of a unique piece of Lalique cast by the cire perdue or lost wax process and bearing Lalique’s thumbprint on its underside is this Frise Monnaie du Pape vase designed in 1920. The shallow 5.75in (14.5cm) diameter vase has a £25,000-35,000 estimate in Bonhams’ sale on February 20. Lalique ‘Gros Scarabée’ vase – estimated at £15,000-25,000 at Bonhams. ‘Gros Scarabée’, a deep amber-coloured vase featuring a pattern of beetles, a design of 1923, measuring 11.5in (29cm) high, is estimated at £15,000-25,000 in Bonhams’ February 20 sale. 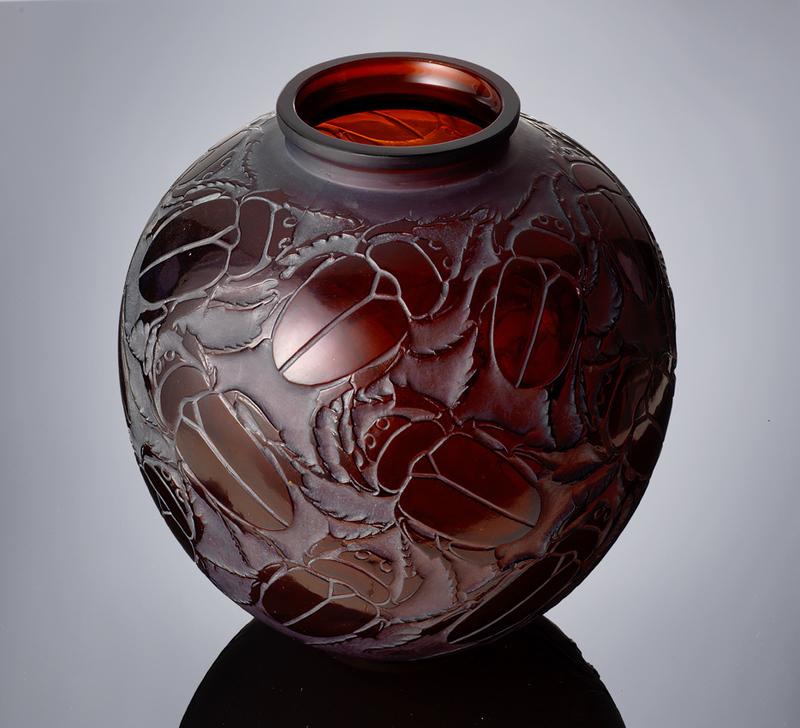 Lalique ‘Grande Boule Lierre’ vessel – estimated at £18,000-22,000 at Bonhams. 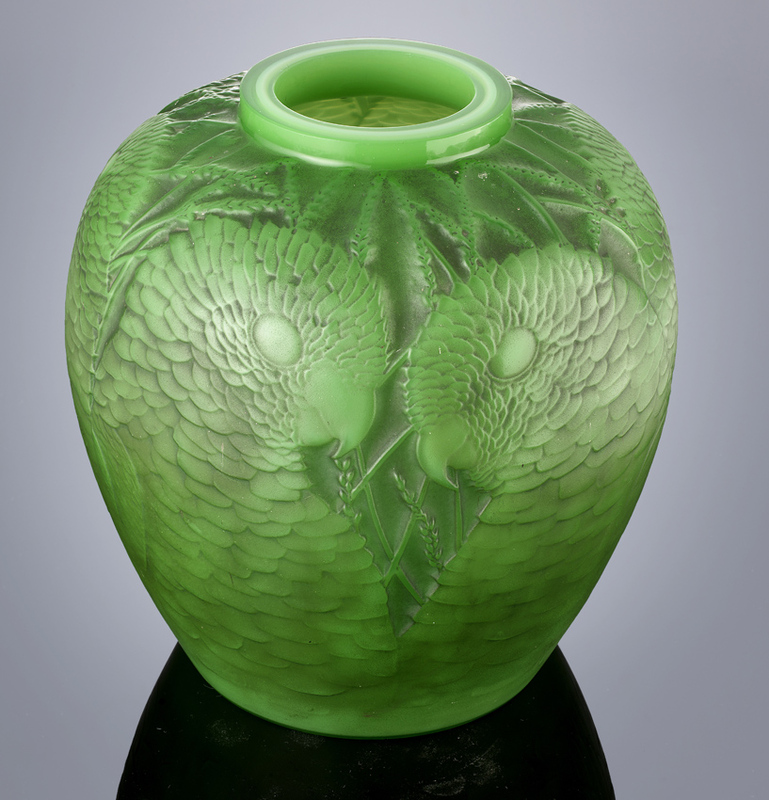 Grande Boule Lierre is a Lalique design of 1919 decorated with ivy in clear, mould-blown and frosted and polished glass with green and sepia staining. The large, 13in (33cm) high, vessel has an estimate of £18,000-22,000 in Bonhams’ February 20 auction.